When Jhonny Peralta debuted in the major leagues as the shortstop for the 2003 Indians, he formed a keystone combination with another rookie, second baseman Brandon Phillips. Peralta was 21, the youngest position player in the major leagues, when he joined the Indians from Class AAA Buffalo in June 2003 as the replacement for injured shortstop Omar Vizquel. Phillips, who turned 22 in June 2003, had won the Indians’ second base spot in spring training. By the all-star break, neither Peralta (.200 batting average) nor Phillips (.210) was hitting consistently. Phillips was demoted to Buffalo. (He would return to the Indians in late August.) Peralta held onto the shortstop job. Peralta started more games at shortstop (69) than anyone else on the 2003 Indians. In 77 games overall for Cleveland that year, Peralta had 55 hits and a .227 batting average. He made eight errors in 624 innings at shortstop and turned 43 double plays. “Defensively, he’s already major-league ready,” Indians general manager Mark Shapiro told the Beacon Journal at the end of the season. Phillips had 77 hits in 112 games for Cleveland and batted .208. He made 11 errors in 925.1 innings at second base and turned 76 double plays. “Brandon Phillips was the largest disappointment of the summer,” Shapiro said. “But I still think he will be a very good major-league player in the future. We just have to adjust our time frame on him. Peralta and Phillips did spend most of the 2004 season at Buffalo. Peralta had 181 hits in 138 games at Class AAA and batted .326 with 44 doubles, 15 home runs and 86 RBI. 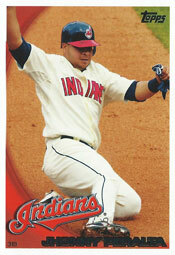 He became the Indians’ starting shortstop in 2005. Phillips had 158 hits in 135 games for Buffalo, batting .303 with 34 doubles, but he couldn’t win a starting job with Cleveland in 2005 and was sent back to Buffalo that year. Just before the start of the 2006 season, Phillips was traded to the Reds and became a three-time National League all-star and Cardinals nemesis.